What are you feeding your family? Do you know where it comes from and what goes into it? Be a Localvore and feed your family the very best, healthiest, freshest food available! Imagine getting nutrient rich vegetables and other produce the very same day they are picked. You'll know where your food comes from and exactly what goes into it. You'll eat healthy, live healthy, and support your local family farm. We grow food for Your family and Ours! Pocatello CSA, Pocatello Farm, Pocatello Local food! Growing food for our family and yours! You have the opportunity to buy “shares” and become members of Swore Farms CSA. Each member receives a box of fresh produce every week during the harvest season (19 weeks). Member have the option of splitting shares with friends. We are planting specifically for your boxes. Early in the year there will be more greens and early crops like peas, and as the season progresses, more variety will be added as it ripens. Our goal is to give you the widest variety of fresh goodies possible. * Honey - depending on the yield, we may have honey to share from our hives. * Yummy Recipes --especially for unusual produce. * Fresh ground whole wheat flour. 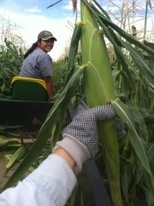 * U-pick Corn stalks for Fall decorating. * An exclusive invitation to our Spring Farm Field Trip! 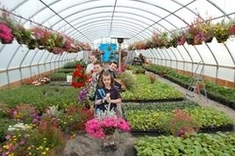 Tour the farm and see where your food is growing. We would love to meet you and your family and show you how our family farm runs. We'll have goodies! 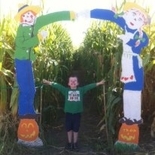 *An exclusive family pass to our Member Only Fall Festival which will include wagon rides, goodies, corn maze passes, face painting, games and more (we plan to make this an awesome experience for your family). 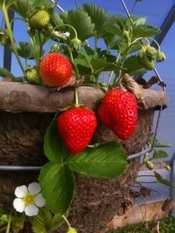 Some years we have strawberries, apples, plumbs and other goodies for our members, but it depends on the year. We cannot control the availability of fruit. So cross your fingers and maybe we'll get lucky again! How does Swore Farms grow my food?- We are a minimalist farm. Many of our crops are grown organically and our main fertilizer is an organic solution made from fish poo and worm castings. We eat the same food you do, so we want it as safe and healthy as possible. We rotate crops to help reduce pests and weeds and rely heavily on good old hard work to hoe out the rows. As a CSA member, you assume part of the risk that we as farmers face every year. For instance, it is possible that one or more of the crops we plant might have crop failure due to something outside of our control (Frost, hailstorm, plagues of locust, brimstone…) If a meteor or bug takes out a crop, then we will not include that crop in your boxes. However, if the harvest is lean but still there, we will fill all our CSA boxes FIRST before we take anything to market. Our CSA members will be our highest priority. When and where do I pick up my box? What if I can’t pick up my box? You need to make arrangements (either with a friend to pick up, or with us 24 hours in advance) prior to pick up time. IF you contact us and request it, we can hold your box for you for a maximum of 24 hours, but we may not have space to refrigerate it. On time pickups are always best! *All boxes not picked up within the allotted time will be donated to local needy families unless prior arrangements have been made. Why pay now instead of weekly?-- As a farm, we pay all planting costs up front in the spring every year. As CSA members, we PLANT for YOU! In this way, you pay for your own food to be planted, watered, weeded, and harvested. Anytime you want to see how your food is growing, call Wendy and stop on by. We’d love to show you around. *Half shares have the option of A. getting a full bushel every other week, or B. getting half a bushel every week. PRINT OFF THE CONTRACT BELOW TO GET STARTED! You MUST fill out the contract application to become a share member. Shares go fast, so get yours in now! Pocatello CSA, North of Pocatello Farm, Pocatello Local Food. Pocatello CSA, Pocatello Farm, Pocatello Local Food.